Located in the heart of the verdant Umbrian countryside, a beautiful large farmhouse restored in 2011 to a very high standard retaining all the important features of the house so as to preserve its history and the marks of the passage of time and capture its soul whilst incorporating highly energy efficient systems and the most modern facilities. 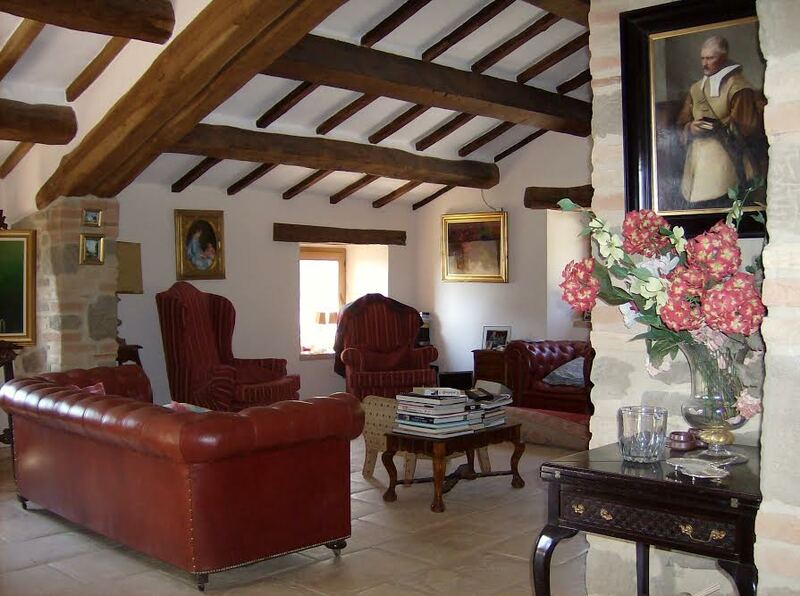 The farmhouse is spacious, luminous and elegant. 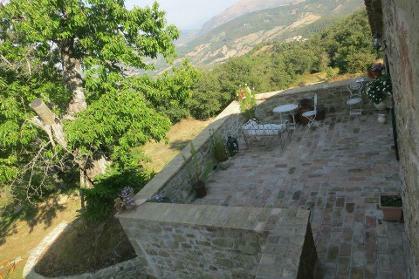 An ideal place for a 3- 6 month sojourn in the heart of Italy, with high level comfort, surrounded by beauty. 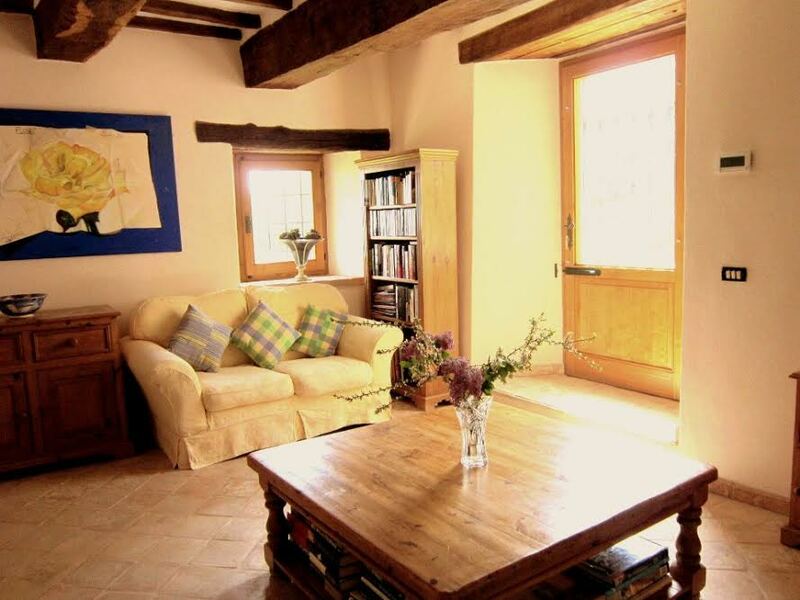 It consists of four double bedrooms all en suite. A large sitting room, dining room, kitchen breakfast room and technical room. The tiles throughout the house are all hand made “cotto”giving it that truly authentic feel whilst It has a modern energy efficient heating system providing virtually zero cost energy and all modern conveniences. 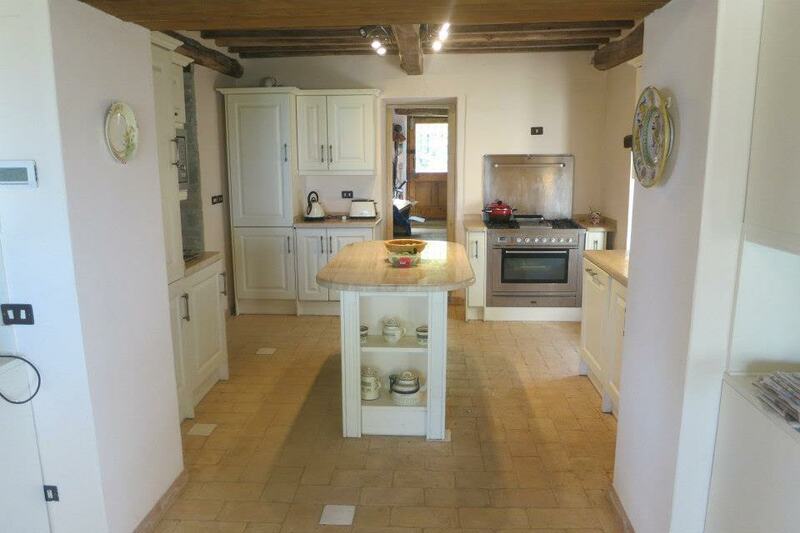 The internal layout has been carefully considered to produce a well balanced family home. 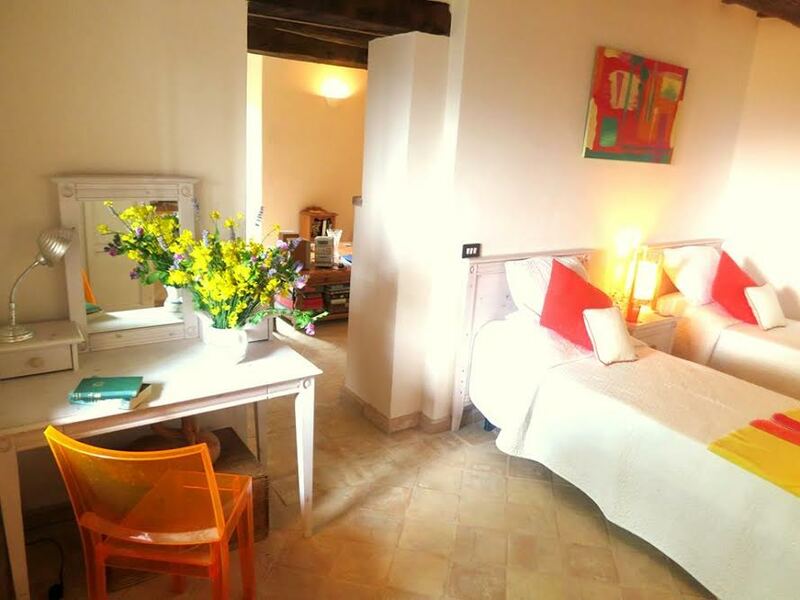 The entrance opens to a spacious hall with storage cupboard and WC and tiled staircase to lower floor (which consists of an apartment with sitting room, double bedroom, bathroom and private terrace), passing through an Umbrian square “arch” with original stones to a panoramic formal dining area. 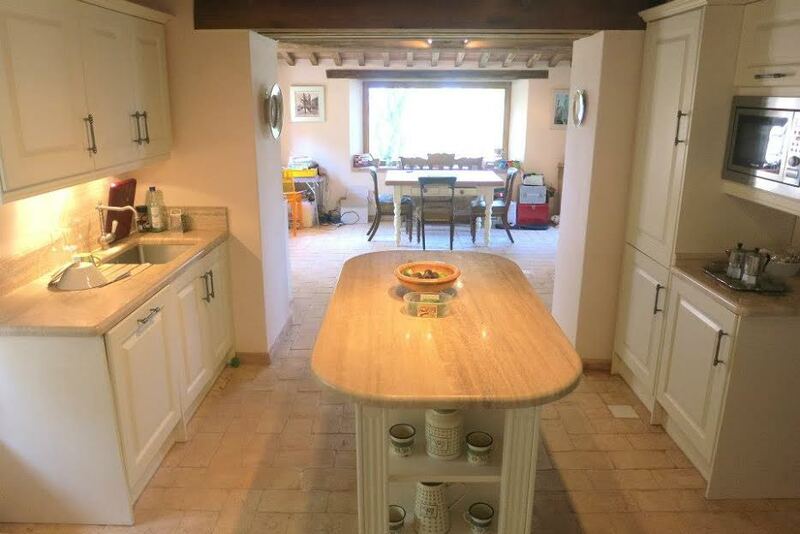 From the dining area there are small lit tiled stairs leading down to a large fitted open plan kitchen/breakfast room with outstanding views and up via a small lit tiled staircase to a stunning sitting room with stone fireplace and wood burner. There is also a utility/technical room with sink and washing machine as well as the operating systems for heating and power. Also from the dining area there are lit tiled stairs leading up to an expansive living room of 38 square metres with open fireplace and access to a panoramic terrace and gardens. The upper floor has three double bedrooms all with modern bathrooms with the Master bedroom with a spectacular view. 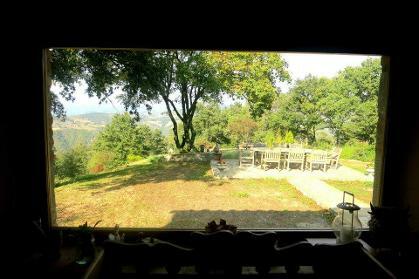 There is a wonderful natural garden together with 4 hectare natural park of woodland and pasture. 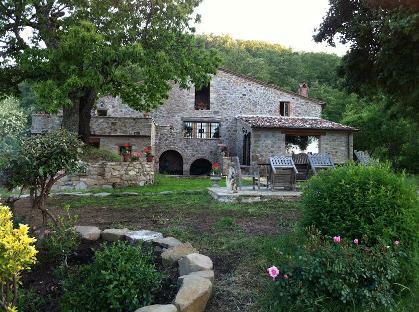 The house is based on an ancient Etruscan site and there is evidence of dwellers in the house in the year 1200. 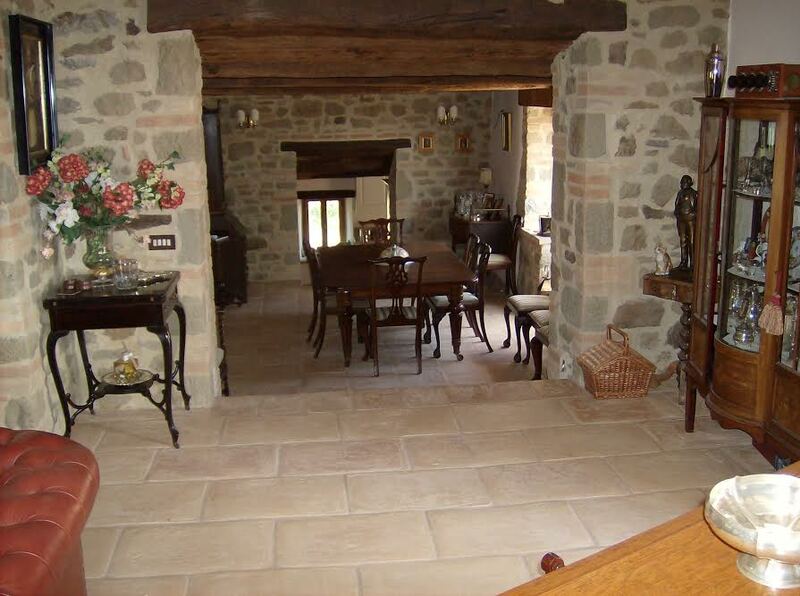 In fact, in the house there are Etruscan stones. The house was re-organised in 2011 using existing materials and complimentary stone. Whilst the house has been restored using existing materials in the style of it’s origin, it operates as a modern house fulfilling all building regulations. The massive beams in the lower apartment are believed to date from the original construction. The original wooden ceiling in the entrance is supported underneath by current building regulation steel and is insulated. The layout consists of 3 double bedrooms all en suite plus a guest apartment consisting of a sitting room, double bedroom, cloak area and private terrace. There is an entrance hall with a cloakroom and storage cupboard. 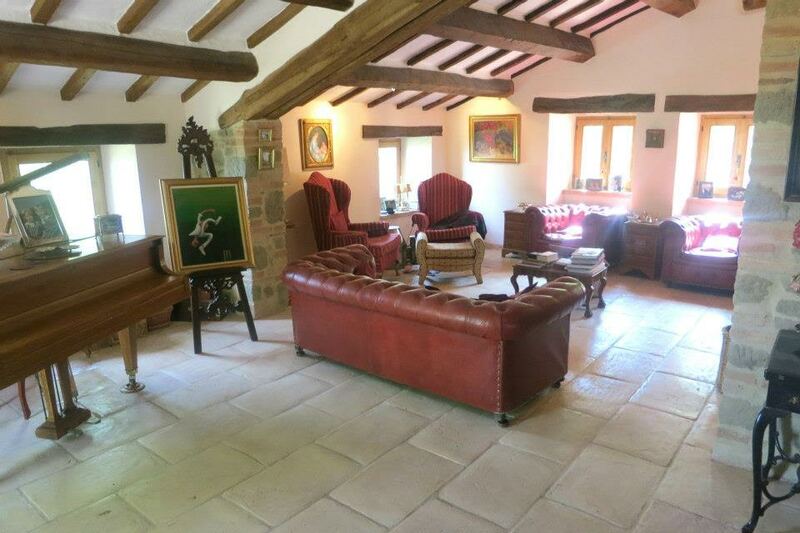 The entrance hall and dining area has original wood ceiling. From the dining area one accesses the large kitchen/breakfast room , the sitting room and stairs leading to the apartment. 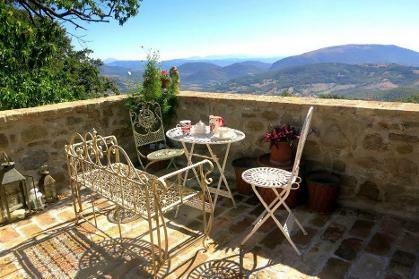 The sitting room leads to a large entertaining terrace with one of the most spectacular views in Umbria. The windows and front double door are constructed using carefully selected chestnut in the traditional way but with full double glazing. Flooring: The floors are are all ventilated underneath but are underfloor heated in 6 control zones. 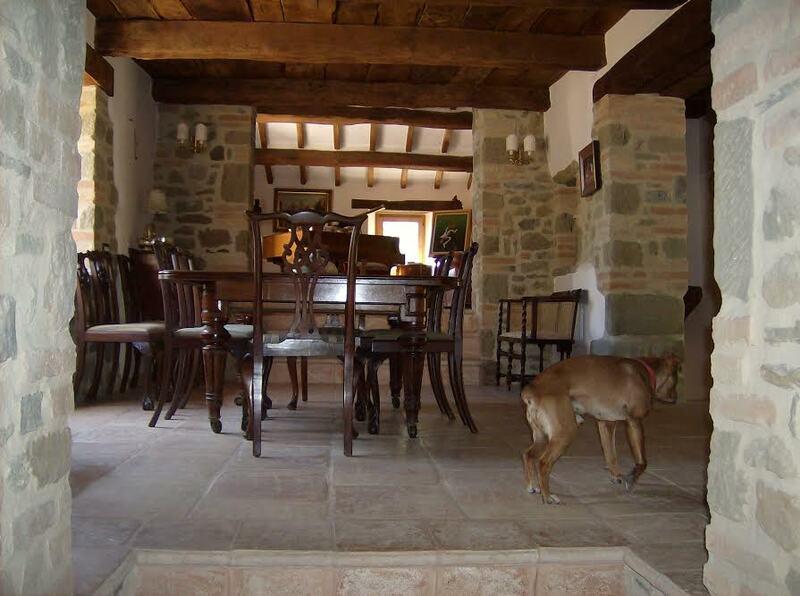 The tiles throughout the house are traditional Umbrian light brown handmade clay, but are coloured very light to enhance the brightness in the house. They are from an original roman tile maker in Orvieto. The plumbing and electricity are completely new. The water is from a fresh water (drinkable) well that has never run dry. The electricity is supported by solar panels that supply 3.6 kw that reduce power bills to nearly zero. There are also solar panels that supply hot water throughout the summer and warm the water in winter sunny days. The underfloor heating system functions from a wood burning furnace supplemented by gas if required. In reality the gas is rarely used apart from cooking. The system is based in a technical room that has the solar panel controls , the furnace (Aspiratronic) and the heating control, a heat bank system (DPS) that enables all heat from all sources to be stored. The system allows drinking hot water from taps. The technical room is also a general utility room and is fully plumbed. Fuel: The property's woods supplies most of the wood but daily supplies are readily available locally. There are more than 10 acres of arable and woodland.